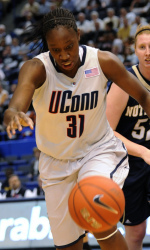 The University of Connecticut women’s basketball team is unrivaled in their sport. The school owns two of the longest winning streaks in basketball history, a 70-game mark the team ran up from 2001-03 and their latest mark, a 71-games and counting streak that started in 2008 and continues until now. That’s right; the team broke their own winning streak record, but does anyone really care? I mean, for starters, it’s women’s college basketball. It’s not like there’s a lot of serious competition out there. There are stand-out players like Elena Delle Donne and Brittney Griner out there, but for the most part UConn outclasses its opponents easily. Save one team. The only team in women’s basketball that might stand a chance of beating UConn is the very team UConn coach Geno Auriemma refuses to play: The University of Tennessee Volunteers. The Vols/Huskies rivalry is one of the best one in sports, but due to some serious bad blood between Auriemma and Volunteers coach Pat Summitt, the winningest coach in NCAA D1 history, the teams will never meet outside of the NCAA Tournament (and usually only in the Final Four there). Geno, if you want anyone to take your team seriously, stop ducking Pat Summitt. If you want to be seen as the best, you gotta play the best.